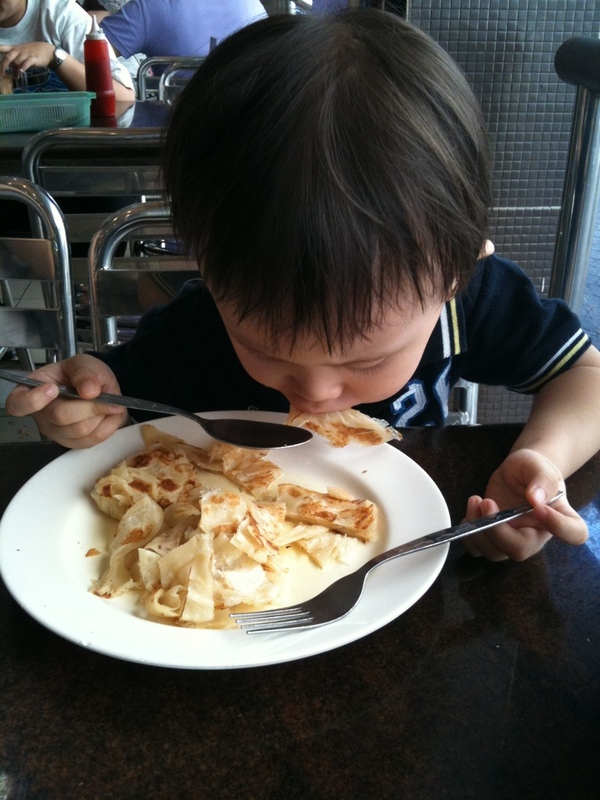 so-sweetcloset: One Roti Canai, Please! This morning, we stopped by at market to buy breakfast. Before I got down from the car, my boy reminded me again to buy him "I want one Roti Canai, Ok?". My boy has very little exposure to Bahasa Malaysia (BM). "Kakak" is the first B.M word which he calls my parents' housemaid. Since my boy can eat more outside food (restaurants/hawker stalls), he get chances to taste different kinds of local food like Pan Mee, Bak Kut Teh, Wanton Mee, Nasi Lemak and Roti Canai. Even sometimes he asks for little Curry Laksa soup. Over times, we notice that he actually picks up some words in B.M such as Nasi Lemak, Roti Canai and the numbers of 1 to 4. We couldn't stop laughing when we overheard his funny B.M speech for first time. My boy: Kakak, satu, dua, tiga, empat... Roti Canai, Nasi Lemak. "Kakak" was stunned and answered: Ya.. ya.. He knows that we talk with "Kakak" in this language (B.M). My boy tries to communicate with "Kakak" too. He just copies whatever he knows. My boy: Kakak, cepat cepat.. sini sini. Until today, he always likes to use his limited B.M to talk with "Kakak". Looks like children learn languages by ear. Better or little, it just doesn't matter, at least they are learning.